Users of MS Outlook might know that from time to time their loyal service is prone to faults and stands in need of PST repair. Inaccessible mail folders don't necessarily result in a data loss. The fault often springs from a mere damage to a header counter and is easy to remedy. A system glitch or emergency program exit can often cause such damage. At these dramatic moments a PST repair tool comes in quite handy. It can repair Outlook files and help regain control over inaccessible folders. With such a tool at hand one can be sure that personal data in MS Outlook folders is ever accessible and secure against possible loss. Outlook Recovery Toolbox repair pst file by several steps. Outlook Recovery Toolbox provides users with a robust recovery capability to repair PST files, Outlook message recovery and regain access to their contents. As well as messages it effectively recovers contacts, notes, journals, appointments, and tasks. 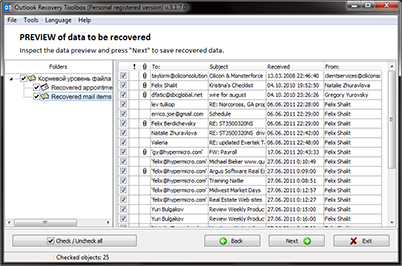 Its recovery engine scans PST files and extracts the information from any Outlook profile to the folders of user's choice. 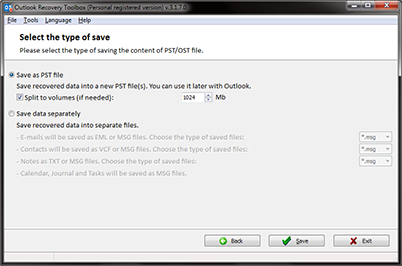 The program can swiftly repair Outlook folders and restore their contents to a new PST file or folders of related data. The folder structure retains that of the original PST or OST file. Files with EML, VCF and TXT extensions will contain messages and other personal data as separate items. One can either drag-and-drop them back to MS Outlook folders or open in any other application with support for the file types. It allows a user not only to repair PST database but also to access personal data as separate items. 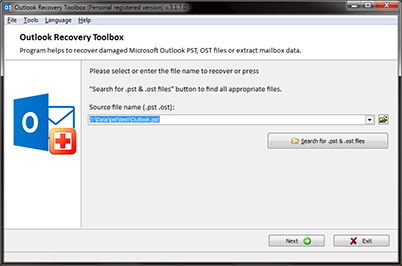 Outlook Recovery Toolbox is PST recovery tool distributed under the Try before Buy License. Customer should download (Outlook PST repair tool download) the repair Outlook pst and outlook pst recovery software first. Later customer should test Outlook file recovery software on the PST file recovery possibility. Three-step Wizard automates the job of Outlook repair and Outlook message recovery. All it needs to know for an effective PST repair is the location of one's profile and the destination for recreated data files. The program runs a search for all PST and OST files in a user's system and then offers the user to choose a particular profile and PST that need recovering. 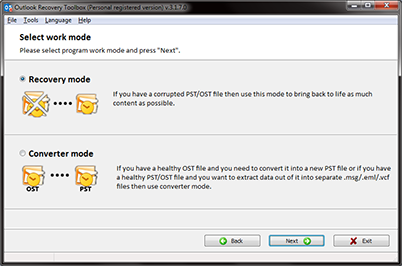 Then repair PST file Outlook 2007 program's recovery engine goes on to repair PST and OST files in the auto mode. Customisable save options allow splitting data into groups under separate folders. Though most of the Outlook repair job is automated users are able to fine-tune the settings and performance. Outlook Recovery Toolbox is a three-step Outlook repair (pst recover, repair outlook.pst, Outlook .pst repair tool) wizard that streamlines and Tender Care for Stronger Protection. Recovery engine and a sophisticated algorithm, which are at the core of the program's commendable performance, carefully handle user's personal data files without re-indexing or otherwise modifying original PST files and execute .pst repair procedure with the initial .pst file. This feature relieves one of the need to backup damaged PST files before the PST file recovery. The other useful feature is the support for attachments and password protection. For those who use Outlook mail service to exchange attachments and encrypted information, the feature stands in good stead. Users are sure to find in Outlook Recovery Toolbox a robust Outlook repair (pst recover, repair outlook.pst, pst recovery tools) tool, simple yet versatile, to solve potential problems and stay in control of personal data. Outlook Recovery Toolbox is repair Outlook pst and outlook pst recovery software. The tool don't repair a source pst file. It just read the source pst file and save all recovered e-mails, contacts and so on into new PST file(s) (or .eml, .vcf and .txt files). The .pst repair software don't require a special knowledges, the Outlook file recovery procedure is clearly. Note: If you need recover lost Outlook Express data then you should use OE-Mail Recovery tool - see description page of Outlook Express file recovery software. The PST recovery software support to repair .pst files with a size more then 4Gb. The repair Outlook folder tool support to recover .pst files with a 2Gb problem. How to recover PST file Outlook 2007? How to recover PST file Outlook 2007? Outlook Recovery Toolbox can repair Outlook file without use installed Microsoft Outlook on a computer, just save a recovered e-mails, contacts and notes in a separate files. 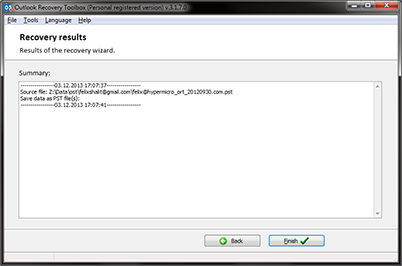 Outlook Recovery Toolbox isn't just PST repair utility, it can export a recovered e-mails into .eml files. Outlook PST repair can convert ost files to pst file. Outlook PST repair tool (pst recover tool, repair outlook files software, pst recovery tools, pst recovery utility, Outlook .pst repair tool) can recover .ost files of Microsoft Exchange. Outlook PST repair tools. To test the .PST repair tool Outlook 2007 recovery capabilities of Outlook Recovery Toolbox, feel free to download the demo version. Please keep in mind that the demo version is only able to recover 5 items per folder. Purchasing a full version will unlock the program and give you access to all the functions of Outlook Recovery Toolbox. Outlook Recovery Toolbox do not support a recovering of contact groups yet. How to recover Microsoft Outlook? How to repair a PST file? How to repair PST file of Microsoft Outlook? How to Recover Outlook Contacts and Emails? How to Recover PST file? Microsoft®, Windows® and Outlook® are registered trademarks of Microsoft® Corporation. Copyright © 2003- Recovery Toolbox. All rights reserved.